Earn 195 - 622 points upon purchasing this product. Use 1950 - 6220 points to purchase this product! The antioxidant leader, pure wild blueberry powder, is harvested from the wilds of Newfoundland’s pristine and ideal agri-climate. Our blueberry powder is the hard to find Canadian Lowbush Wild Blueberry Vaccinium Angustifolium. 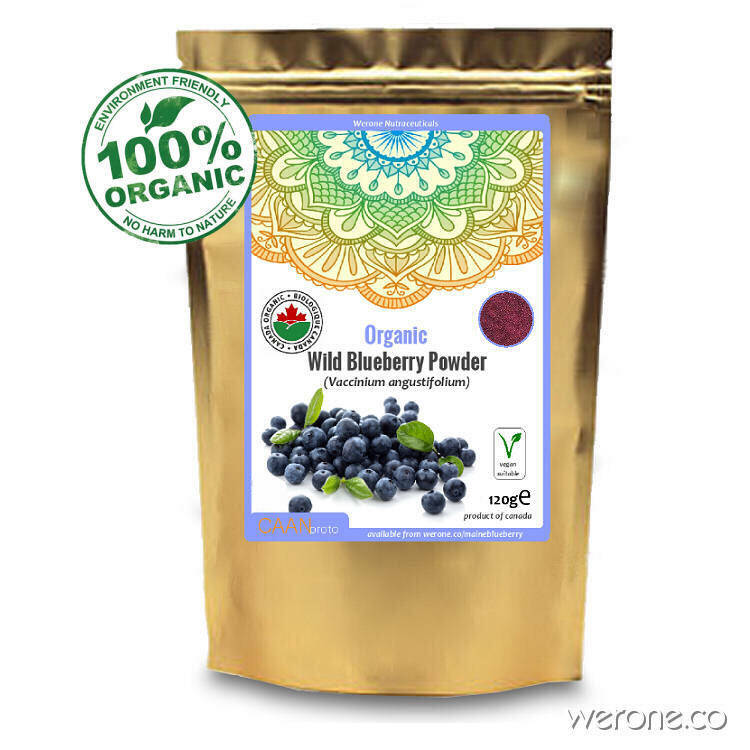 Our Canadian Organic Wild Blueberry Powder holds to the highest standards of purity and is committed to providing superior blueberry taste in nutraceutical powder form, with all the nutritional value of fresh fruit. Our Extraction Process and Concentration. Our powder is 100% wild low bush blueberry, dehydrated into power. There is nothing else, just powder. It takes 10 cups of berries to realize 1 cup of powder. Low bush wild blueberries can not be machine harvested given the fact they are 4-12 inches off the ground, harvesters pick the blueberries by hand. They are by far, the most nutritious blueberry you can eat and given Newfoundland’s pristine ecology, further sets them above and beyond traditional cultivated organic blueberries that are affected by proximity to airborne and subterranean pollutants. They are HQF (high quality frozen). As demand requires, we take frozen berries, convert to Berry mash, then dehydrate. Refraction drying is done at low temperatures for raw vegan compliance and to retain the highest possible nutrient retention. Refraction systems for commercial production cost millions and are not autonomous, they need the human touch and loving oversight. The folks who undertake this role are good, hard working people who care about what you eat. Good product. Still trying it out. Am wondering if it is as concentrated as the other powders I’ve been using. Seems good. Great service from the company! Just what I needed. Unfortunately there was a problem with shipping, but this was solved to my complete satisfaction.